I don’t know what it is exactly – but I turbo hate to waste time on food and person prep. It’s like I just need to get to the next thing, and pesky irritants like using a cutting board to dice vegetables or taking my clothes off to iron them are too distracting. So, I cut corners in the most dangerous and obscure ways I will outline below. 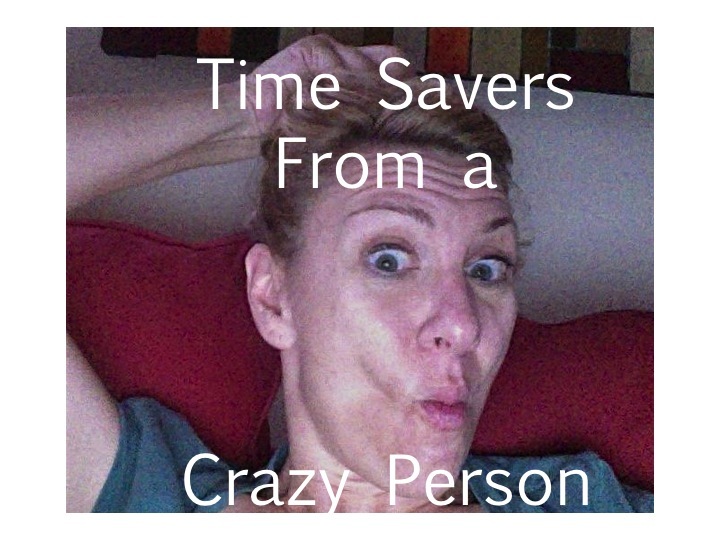 Please avoid doing any of these time savers unless you are Houdini’s descendant or a voodoo master skilled in limb reanimation. Use your palm to cut food. Don’t use a cutting surface that doesn’t bleed! Slice and dice onions and peppers and cheese and all manner of edibles like even steak and baguettes right in the crook of your hand! Getting out the cutting board take precious milliseconds you just don’t have today. If you get real good, you’ll barely miss chopping off vital artery conduits! Hey, that potato is worth it. Real life example: I carve off tiny pieces of green pepper right into the pan cooking my scrambled eggs. I wear long sleeves, too. That way, when the fabric dangles into the stove’s fire, my face can blow up. Iron your clothes when they’re still on your body. Why would you waste time carefully spreading your clothes on an ironing board or other heat-resistant surface? You’ve got skin, Jack, and while not impervious to temperatures above 200 degrees, your clothes are already on it. Just carefully slide the searing iron down your legs (wear pants for this one) or gently smooth the collar of your shirt still on your neck. Putting on and taking off clothes is so tedious. Also, just sleep and exercise in whatever you wore today. Real life example: Upon ironing my shorts naturally still upon my person, I went too far with the iron’s tip, forever blazing a triangle scar on my upper thigh. Don’t fully put on your shoes. Or wear someone else’s that are too big so you don’t have to tie anything. This works especially well when you’re taking the kids to school. It’s early, your palm is lacerated and your neck is encased in burn salve. You just don’t feel like getting all-the-way ready to drop the kids off in the morning. Easy solution: slip your feet into the shoes you wore yesterday, but (here’s the key): don’t completely put your feet IN the shoes. Let your heels hang out, shuffle your way to the car, and then try to properly situate the shoes at each stop light. If you do this right, your head will be below the steering wheel and at shoe-level when the light turns green and you’ll hit your head on the way up, careening you, the car, and your kids into the more prepared parents walking their children to school in effectively implemented footwear. Alternatively, find your husband’s shoes that are four sizes too big preventing you from actually feeling the gas and brake pedals with your own toes. Real life example: All the stuff I said above. Use a face mask to cleanse your face and take off your eye makeup. It’s not my fault you ran out of cleanser and use a clay-based mask to shave your legs and remove mascara from your delicate eye area. I never told you that same mask could be used as a zit dryer, toothpaste, cold remedy, contact lens solution, multivitamin, and hangover remedy. Real life example: See up there. This seems as good as any place to stop before we all die. For more helpful time-savers, visit Dumb Ways to Die. Or a pick up a Gray’s Anatomy. It’s been cold and snowy over here. Perhaps you’ve heard. Two weekends ago I just gave up ever tying my boots. It’s bad enough that I have to wear them! Who cares that I could just step out of a boot and into a snow drift of that the traction on the boot does nothing to save me from a fall on the ice when my foot is not secured inside it? WHO CARES? I Don’t Have Time For Tying!